Editing is absolute in the sense that there are national based standards of grammar, punctuation and format—a square must have four corners. However, syntax, cohesion, style and logic… that’s when relativity is introduced. The artist determines if the square will be big and bold, wide or short, subtle or transparent. The job of the editor is to ensure the absolutes are in tact, the message and style is preserved as the author intended, and finally, that the piece of work is identifiable with the target reader. This “Before-and-After” excerpt gives you a glimpse into the Real Eyes editing approach and process. From proofreading (commas, extra spaces and misspellings), citations, graph and table reformatting, to a complete comprehensive review (paragraph transitions, syntax , suggestions on audience resonation). 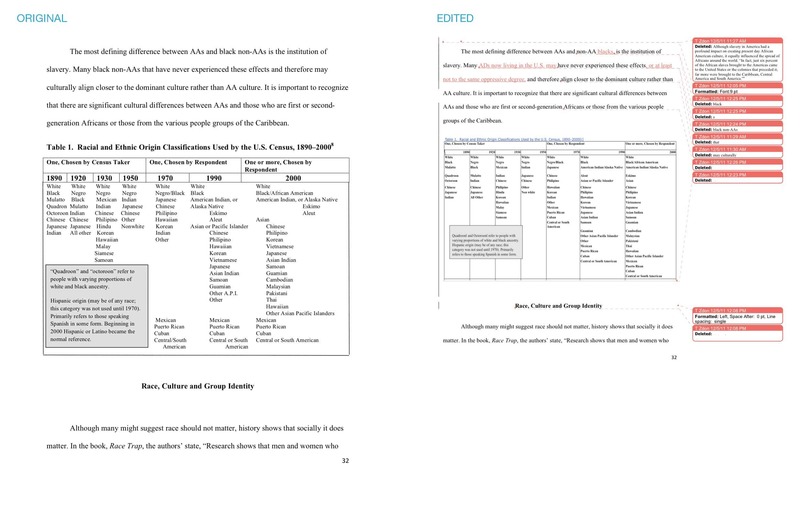 Clients receive edits via Word Tracked Changes, as direct edits in-text, as well as in query or comment form in the margin. Rounds of editing for academic work are typical, allowing for client reaction and learning along the way.